“Humsafar” as we know it, the drama that swept its audience off their feet, turned on the trebling symphony of interest from all around Pakistan. A ray of success about to meet its end on the 3rd of March, but before that we have decided to celebrate this success and this end of the victorious soldier of our drama industry. Alongside which we will compliment the journey of this drama by giving its audience a day to relax and therefore isolate themselves from the hustle and bustle of this ever busy city, Karachi. 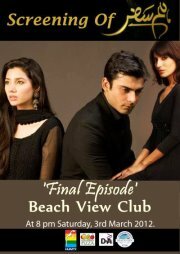 HUM TV in collaboration with D&A Medias is proud to announce an exclusive screening of Humsafar’s last episode for its fan to be able to enjoy the finale with their friends and family. We have decided to bring Karachi, “The City of Lights” to Life, and by partnering with Hum TV we wish to provide our fellow karachiites with a new definition of leisure and joyfulness. Lets bid Ashar and Khirad farewell with a big bang and lots of fun on the side! And a fun filled theme with lots of entertainment. .